Meathead Movers is proud to serve you and your family as your Merced movers of choice. Our clean-cut student-athlete movers are dedicated to fulfilling your moving needs efficiently, saving you time, money, and unnecessary stress. 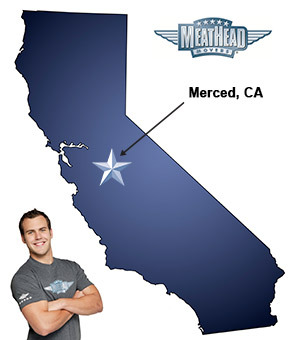 Meathead Movers is committed to providing exceptional service to the Central Valley and beyond. Our local, professional, and friendly Merced movers are here to help families make the transition to their new community without missing a beat. By hiring drug-free student-athletes, we offer a streamlined moving experience unlike any other. Located on the original Yosemite Highway, Merced is a spirited community that has seen significant growth in the past decade. Families moving to Merced will appreciate the small-town atmosphere and the many recreation opportunities in the area. Of course, Merced’s Central Valley location makes it a center for agricultural business. Families from Merced value the city’s outdoor parks and recreation system. The city boasts extensive bike paths, public parks, a wetlands area and several golf courses. The city is also home to Applegate Park and Zoo which is a favorite among families. Even more recreation opportunities can be found by those willing to make the drive to nearby Yosemite Park, one of the state’s most popular natural attractions. Downtown Merced is home to many boutiques and restaurants, and is conveniently located near to the Merced Antique Mall. Visitors and residents alike enjoy visiting the downtown area to chat with friendly merchants or catch one of the many festivals hosted in the town every year. The Polynesian Dance Festival and Market on Main are among the most popular. Of course, moving is stressful no matter how much you’re looking forward to your new home. Whether moving to or from the area, you can trust our Merced movers to deliver your belongings in shape and on time. Our employees are all clean-cut student-athletes from nearby colleges and universities such as UC Merced. Our moving company specializes in local, long-distance, and commercial moves to, from, and within Merced. We also provide reliable packing, storage, on-site relocations, and our distinctive moving concierge service, which connects you with local service providers. All our student-athlete movers are thoroughly screened and trained before their first move. With branches not just in Merced, but all throughout California, we are your one-stop resource for all your moving needs, no matter where your California move takes you. Merced is an economically robust, welcoming community. As your Merced movers of choice, we’re proud to take care of every step of the moving process. Fill out our quick online form today to get your free moving quote. Friendly and efficient. They arrived on time and were extremely careful not to do any damage to the walls or doors while moving the carefully wrapped and prepared furniture. The two young men were always courteous and respectful. We will definitely use Meathead movers in the future! They guys are super friendly, helpful, and strong! I actually had more stuff then I had thought and they called and got an extra guy in very quickly to keep my costs down. I appreciate all their help, they made moving day extremely easy and stress free. Very very professional and hardworking! Totally a joy to work with at every level, from the phone intake to scheduling to the actual move! I would use them again and again! Highly recommended! Movers were INCREDIBLY courteous and accommodating. Mine was an unusual move. I wanted to empty a 45' tractor trailer van & move items about 500' to my backyard. This was a first for them. The two young men they sent were professional & good sports. I appreciated their sense of humor on a hot summer day. The only issue I had was trying to add additional notes when going through the sign up process. I finally had to give up & call a real person. They were pretty wonderful too.